Julia Bryan-Wilson, an art historian interested in issues of labour and work and feminist and queer theory, contributed to the fourth and final day of the Studium Generale Rietveld Academie conference-festival Hold Me Now: Touch and Feel in an Unreal World (21–24 March 2018). Responding to the call by Jack Halberstam, curator of the day’s programme, to become ‘philosophers of the feel’, Bryan-Wilson reflected on a work by artist Rebecca Belmore to examine what accountabilities materials demand or suggest, and to question if and how an artist’s engagement with these materials can create alternative histories. In this interview with Steyn Bergs, Bryan-Wilson explains and elaborates on some of the issues brought together in her talk, titled ‘Material Relations’. Steyn Bergs: To contextualize your talk ‘Material Relations’, which centres on Rebecca Belmore’s work Biinjiya'iing Onji (From Inside) produced for documenta 14 last year, let’s consider your work as an art historian. Besides being profoundly affected by feminist and queer theory and politics, your research into art and labour is attentive to art as a kind of labour and relationship to other fields since the 1960s. Artistic labour figures as the ‘other’ with respect to productive labour under capitalism, a potential antidote to its deadening effects, a safe haven, a sort of refuge for authentic experience or prototype for non-alienated and non-alienating activity. Your first book Art Workers: Radical Practice in the Vietnam War Era (2009) explores this terrain through 1960s and 1970s figures such as Carl Andre, Lucy Lippard and Hans Haacke. You detail their push to debunk this perception as an ideology that (economically and otherwise) served the then elite of the art world. They did so through explicitly identifying themselves as productive labourers, and emphasizing how their work was subsumed by or imbricated in capitalist production. Recently, however, your approach has shifted. In Fray: Art and Textile Politics (2017) and this talk, you look at how ‘artisanal’ techniques or craft work (often feminized work that may appear outmoded in the face of technological development within and outside of art) can become practices of resistance due to, for instance, the forms of sociability they foster. Julia Bryan-Wilson: Yes indeed, work and labour – and the two are not precise synonyms – have been at the core of what I think about. But you could also say that an even broader interest is process. So, I examine questions of how things get made, who makes them, and what they are made of – and these are questions that, to me, connect labour with issues related to the potency of things and their materiality. And when I say materiality, I mean not only the materials that they are literally made of, such as yarn, or marble (in the case of Rebecca Belmore), or zinc plates (in the case of someone like Carl Andre) but I also want to evoke materialism in the Marxist sense. This is a kind of materialism that looks at what economic and social relations are required to bring those specific materials into visibility as artistic objects. What kinds of extractions, what kinds of manipulations, what kinds of procedures have to be undertaken to move something like copper from a mine to an art gallery? This investigation into materials definitely came up in Art Workers, and questions about process are also attended to in my book Fray, which is about fabric and textiles. It also plays a crucial role in my recent work on this Belmore piece – though this article is not a book project, and therefore does not have the same extensive theoretical apparatus – where I want to examine how materials can, in a way, tell their own stories. Being attentive and careful with issues of materiality might lead us to ask different questions about how an artwork might function, politically and ideologically. The Belmore work that you look at in this talk is made of white marble, one of the most distinctly artistic materials one can think of, associated as it is with classical sculpture as the supposed origin of art and art history. You take this material as a starting point to discuss how whiteness dominates the narrative of art history, as manifest in the whitewashing of the history of Ancient Greece, which you relate to the polychromy debate – the discussion, ongoing within art history since the nineteenth century, concerning the original colours of classical sculpture. We are living in a moment (maybe globally, but definitely in the United States) in which very important questions concerning race and racism are being raised in all kinds of arenas, including in art history. Of course, art history as a discipline has often made very specious designations between ‘high’ and ‘low’ art, for example, or between ‘tribal’ and ‘modern’: designations that are extremely loaded with racist hierarchies and categorizations. And fundamentally, within this discipline, one point of origin for many of these hierarchies is the misunderstanding that ancient Greek sculpture –which has been heroized and exceptionalized as if it were the pinnacle of all cultures – was uniformly white, and that this whiteness was a representation of what we now understand to be white skin. Now, scholars of the classical past have known for a long time that these sculptures were mostly not white at all – they were painted, polychrome – but in the popular imagination many still seem to think of them that way, which corresponds to a completely flawed image of antiquity as full of lily-white people. This racial ignorance is something that Belmore, an indigenous woman from Canada, seems to confront when she situates her marble tent in Athens to look out over the Acropolis. I wanted to think about how white marble, and the Acropolis itself, signifies for different people on many different registers. On the one hand, here is this monument of what we might call ‘Western civilization’ – yet it is in shambles at the moment; the Acropolis seems to be perpetually under construction, as if it can never truly be restored. And Greece, which is heralded as one centre of this kind of classical heritage, is at the same time under attack because of EU policies of precarity and austerity, and because of its complex position vis-à-vis the refugee crisis. We face a very important and interesting concatenation of contradictions, and I think the Belmore sculpture presents an opportunity to think through some of these contradictions precisely because of its use of white marble. What does it mean to return to unadorned white marble in this moment – knowing, of course, that unadorned white marble was not the norm for figurative statuary in the classical world? You mention several contradictions that arise in thinking about this work in relation to its context. Another is the material’s identification with monumental grandeur versus Belmore’s use of it to make something modest, unassuming and human in scale, which you argue makes it a counter-monument. Yes, I found it useful to return to James E. Young’s idea of the counter-monument,1 which is a term he originally developed in relation to Holocaust memorials in Germany. And of course I am not drawing an oversimplifying parallel between the Holocaust and the genocide of indigenous populations in the Americas, but Belmore’s tent seems to partly partake of a counter-monumental vocabulary, which we might understand not only as a grammar born in the aftermath of trauma, but also a minoritarian resource for those speaking back against human rights violations and structural racism. 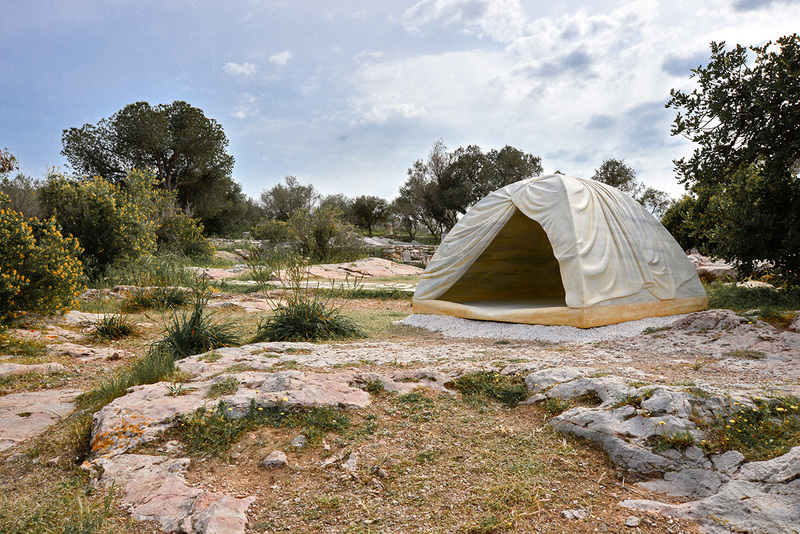 In this work she activates and utilizes a kind of humbleness: the modestly scaled tent can also be seen as a monument to the refugee crisis and to issues of displacement and statelessness – issues that are obviously urgent in the context of Greece circa 2017, but also within the context of Canadian indigenous histories and current realities. The marble tent evinces a desire to engage in a recognized form of monumentality. At the same time Belmore critiques the notion of monumentality and addresses the viewer on a more intimate level. This is a characteristic of the counter-monument, namely that it elicits a tactile response or a personal connection. And that brings us to the topic of the Studium Generale Rietveld Academie conference: touch and the tactile. Most counter-monuments are characterized by a strong haptic engagement, or at least a bodily engagement. Many of them are about feeling, rather than knowing. Tactility is also important to Belmore’s work: people clearly experience a strong impulse to interact with the piece. 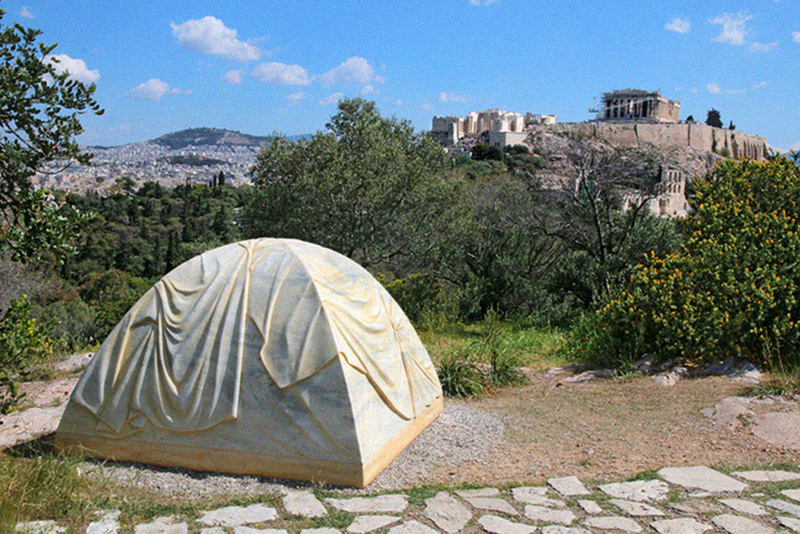 Absolutely, the tent does invite you to go inside, and really it is only completed when you do so – when you sit down and look at the Parthenon. And of course, you want to caress that marble; it is outside in the open elements, rather than in a gallery that might discourage such a touch. Furthermore, it is cool and shady inside so that the sculpture offers shelter from the heat. Although I don’t believe we often think of marble as something that we have a clearly tactile relation to – unlike, for instance, textiles, which we are habitually conditioned to touch – it is interesting to think of this use of marble, in this small tent, as proposing a bodily encounter. That solicitation is an important part of the piece. In your talk you mention that the reception of Belmore’s piece was affected by the critique that was waged against this edition of documenta more generally. Some, however, argued that this work in particular banalized issues such as the refugee crisis or homelessness due to the effects of the economic crisis in Greece. Well, the global inequities that we are confronted with are just so massive that it becomes a challenge for artists to find a language to talk about them – a language without condescension, without belittlement, but also without over-monumentalization. Over-monumentalizing is a common objection lodged against some of the work that Ai Weiwei has done about similar issues: for instance, the 2016 piece in which he covered the pillars of the Berlin Konzerthaus in life jackets used by refugees. There is something spectacularizing about that. But it is almost an unresolvable issue: what are the appropriate formal means that we have at our disposal to address something so overwhelming, so bitter and bleak? In the case of Belmore’s piece, the fact that the sculpture moved locations from Athens to Kassel, that the marble itself migrated, strikes me as suggestive and quite powerful. Because then the work itself becomes a metaphor for the extraction of resources as they are mined or quarried from less economically secure nations, like Greece, for the benefit of the wealthier ones, like Germany. By the way, I did originally plan to say something about Ai Weiwei in my talk: his restaging of that photograph of himself posing as a Syrian child dead on the shores near Bodrum was appalling to me. That kind of stagey, mistaken substitution does not feel to me like the best strategy to confront these issues. In your analysis of Belmore’s piece you include not only the work itself but also its subsequent mediations: the circulation of pictures of people engaging with it on social media and the Internet generally. This led to a fair share of criticisms as well – though obviously this is not something that, as an artist, you always have much control over. No, of course there are some people who try to control those mediations, like Tino Sehgal, but still there are all kinds of images of his work circulating on the Internet, much as he tries to ban them. The smarter response is for artists to anticipate and consider the consequences of those mediations since they know that people are going to post images of themselves interacting with the art. An example would be Kara Walker’s A Subtlety, or the Marvelous Sugar Baby (2014). She knew full well that people were going to engage in a wide spectrum of behaviour, including potentially disrespectful racist and sexist acts involving themselves and this large black female Sphinx figure, and it seemed to me that Walker was interested in asking the question: what possible meanings does this spectrum of interfaces generate? What does it say about tendencies to vulgarize, to sexualize, to denigrate and to trivialize via these touristic kinds of engagements? And I want to think carefully about the many photos of viewers interacting with Belmore’s sculpture, because I do not simply want to say: ‘look at these foolish people smiling in this refugee tent!’ There is an understandable impulse to want to mark a moment of yourself being somewhere. I certainly do not want to say that all of these people are just parading their ignorance, because we cannot simplify these experiences and act as if they all had one texture. Rather, these mediations say something about the structure of documenta as an art exhibition that encourages pilgrimage, and about our saturation with mediatization – it is the air we breathe now. One thing I did not say about the sculpture but which comes to my mind now is how hard it would be to take a picture of yourself inside the tent and also capture the Parthenon. Any photo you are going to take, perhaps of yourself, might only ever be partial: you can get either the tent, or the sightline to the Parthenon, but never both – and both are crucial to the entire project. It is a reminder of the contingency of place, perhaps – the idea of partial situatedness. The tent presents itself as an ambiguous situation for the artistic spectator: what is the appropriate response when faced with it? Is there such a thing as an appropriate response? For me, Belmore’s sculpture does incredibly dense political work precisely because of the ambiguities it opens up. 1. James E. Young, ‘The Counter-Monument: Memory Against itself in Germany Today’, Critical Inquiry 18, no. 2 (Winter 1992): 267–96. Biography: Julia Bryan-Wilson is Professor of Modern and Contemporary Art at the University of California, Berkeley. She is also the Director of the UC Berkeley Arts Research Center. Her research interests include theories of artistic labour, feminist and queer theory, performance, production / fabrication, craft histories, photography, video, visual culture of the nuclear age and collaborative practices. She is the author of the books Fray: Art and Textile Politics (2017), Art in the Making: Artists and Their Materials from the Studio to Crowdsourcing (with Glenn Adamson, 2013) and Art Workers: Radical Practice in the Vietnam War Era (2009). She is the editor of October Files: Robert Morris (2013), and co-editor of two special journal issues (‘Visual Activism’, Journal of Visual Culture, 2016 and ‘Time Zones: Durational Art in its Contexts’, Representations, 2016). With Andrea Andersson, she curated Cecilia Vicuña: About to Happen, which opened at the Contemporary Arts Center New Orleans in 2017 and will travel to the Berkeley Art Museum, Henry Art Gallery and ICA in Philadelphia. Her articles have appeared in Afterall, Art Bulletin, Art Journal, Artforum, Bookforum, Camera Obscura, differences, Frieze, Grey Room, October, Parkett, Journal of Modern Craft, Oxford Art Journal, TDR: The Drama Review and many other venues. She is currently writing a book about Louise Nevelson.